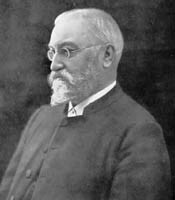 Ethelbert William Bullinger AKC (December 15, 1837 – June 6, 1913) was an Anglican clergyman, Biblical scholar, and ultradispensationalist theologian. His formal theological training was at King's College London from 1860–1861, earning an Associate's degree. After graduation, on October 15, 1861, he married Emma Dobson, thirteen years his senior. He later received a Doctor of Divinity degree in 1881 from Archibald Campbell Tait, Archbishop of Canterbury who cited Bullinger's "eminent service in the Church in the department of Biblical criticism." Bullinger's career in the Church of England spanned 1861 until 1888. He began as associate curate in the parish of St. Mary Magdalene, Bermondsey in 1861, and was ordained as a priest in the Church of England in 1862. He served as parish curate in Tittleshall from 1863–1866; Notting Hill from 1866–1869; Leytonstone, 1869–1870; then Walthamstow until he became vicar of the newly established parish of St. Stephen's in 1874. He resigned his vicarage in 1888. In the spring of 1867, Bullinger became clerical secretary of the Trinitarian Bible Society, a position he would hold till his death in 1913. Bullinger was editor of a monthly journal Things to Come subtitled A Journal of Biblical Literature, with Special Reference to Prophetic Truth. The Official Organ of Prophetic Conferences for over 20 years (1894–1915) and contributed many articles. In the great Anglican debate of the Victorian era, he was a Low Churchman rather than High Church sacerdotalist. Primary editor of The Companion Bible (published in 6 parts, 1909-1922 ISBN 0-8254-2177-2. It was completed after his death by his associates. These works and many others remain in print (2007). Bullinger's friends included well-known Zionist Dr. Theodore Herzl. This was a personal friendship, but accorded with Bullinger's belief in a Biblical distinction between the Church and the Jewish People. Completion and publication of a Hebrew version of the New Testament under a TBS contract with Christian David Ginsburg after the demise of Isaac Salkinson. Publication of Ginsburg's first edition of the Tanakh (Introduction to the Massoretico-Critical Edition of the Hebrew Bible). Formation of the Brittany Evangelical Mission Society under Pasteur LeCoat and translation of the Bible into the Breton language. First-ever Protestant Portuguese Reference Bible. Distribution of Spanish language Bibles in Spain after the Spanish Revolution of 1868. Bullinger was also a practiced musician. As part of his support for the Breton Mission, he collected and harmonized several previously untranscribed Breton hymns on his visits to Trémel, Brittany. Bullinger's TBS workload in his later years was reduced by the assistance of Henry Charles Bowker and Charles Welch. Their assistance enabled him to focus on The Companion Bible in his final years. Bullinger and Ginsburg parted ways, and another edition of Tanakh was published by the British and Foreign Bible Society. Bullinger's views were often unique, and sometimes controversial. He is so closely tied to what is now called "hyperdispensationalism" that it is sometimes referred to as Bullingerism. Noted dispensationalist Harry A. Ironside (1876–1951) declared Bullingerism an "absolutely Satanic perversion of the truth"  Bullingerism differs from mainstream dispensationalism with regard to the beginning of the church. Mainstream dispensationalism holds that the Church began at Pentecost as described early in the New Testament book entitled "Acts of the Apostles". In stark contrast, Bullinger held that the church, the so-called Body of Christ, began after the close of Acts, only revealed in the Prison Epistles of the Apostle Paul. Outside of ultradispensationalism, many other examples of Bullinger's unique views can be found. For example, Bullinger argues that Jesus was crucified with four, not just two, criminals. Bullinger argued for mortality of the soul, the cessation of the soul between death and resurrection. While Bullinger did not express any views concerning the final state of the lost, many of his followers did hold to annihilationism. Purportedly, Bullinger was also a member of the Universal Zetetic Society.